Yes, Obama. And he also wrote the damned screenplay. Now don’t get me wrong. I’ve always known that comedians are some of the smartest people in the business. 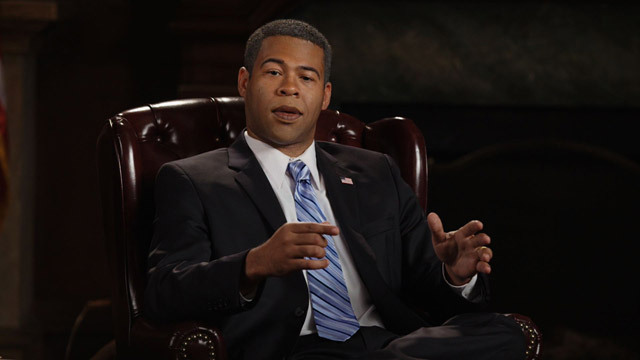 And although I haven’t seen the other movie Peele co-scripted (Keanu), I have seen a lot of his comedy work over the years, not only on his current show, but also on Mad TV back in the early twenty-oughts. So pardon my surprise that he’d not only choose to write and direct a horror film, but a helluva good one at that – it is easily the smartest, most enjoyable one I’ve seen since Joss Whedon’s Cabin in the Woods (2012). As usual, I will be constraining myself to direct commentary about only the first 15-20 minutes of the film, and avoiding all spoilers thereafter. If that’s too much for you, please read after you’ve seen the movie. The story begins with young couple in love Chris Washington [Daniel Kaluuya] and Rose Armitage [Allison Williams] getting ready to head out to her parents’ place for the weekend. It’s the first time Chris has met the parents, and he’s concerned that Allison hasn’t let them know he’s Black. “They’re not racist,” she assures him – although she promises her dad will tell him all about how he’d have voted for Obama for a third term if he could’ve. The two head out. On the way, they hit a deer, which lay moaning on the side of the road. When the attending cop asks for Chris’s ID, Rose goes to bat for him, pointing out that he wasn’t driving, and there’re no grounds for the request – the police officer backs off, and the two head on down the road. Rose’s parents, Missy [Catherine Keener] and Dean [Bradley Whitfield] are true to Rose’s description, right down to Dean talking about Obama. They even have a dysfunctional alcoholic son (Jeremy) [Caleb Landry Jones] who tries to start something with the new boyfriend. They’re the perfect Hampton’s idyll, with their home on the lake, and plenty of very rich, very white friends. Wealthy liberals who would be horrified to be called racist, but who show their discomfort with having an African American in the house with every comment, glance, and awkward “My man!” And things just get weirder when a whole gaggle of the Armitage’s friends show up for a party at the property the next day. Chris soon realizes there’s something a bit more that’s off than just the polo shirts and background badminton games. There are two black servants on the property – Walter [Marcus Henderson] and Georgina [Betty Gabriel] – and both seem oddly uncomfortable whenever Chris tries to engage them. It’s like the whole world is slightly off-center – shunted 15 degrees to the right or left – and Chris is worried that maybe he’s being just a little bit too paranoid. Back in New York, his best friend Rod [Lil Rey Howery], a TSA agent with a talent for believing conspiracy theories, looks after Chris’s dog for the weekend. He’s the comic relief for the movie, and steals every scene he’s in. Newcomer to American audiences Daniel Kaluuya (he’s British, and got his start as Posh Kenneth in the excellent Channel 4 series Skins) is absolutely solid as the increasingly bewildered boyfriend, just trying to get along with a bunch of people who don’t quite know how to talk to him. Allison Williams is very believable and sympathetic, and both Keener and Whitford are always a pleasure to watch. Interestingly, Whitford was also in Cabin in the Woods – perhaps he’s the common denominator that has me loving both films. Lately, we’ve been treated to a bunch of excellent films in the theaters, such as Logan and John Wick II (click on either title to read our reviews), and Get Out fits solidly in this field, filling out the Horror category for must-see movies this spring. A surprisingly scary movie written and directed by funnyman Jordan Peele, a highly recommended movie perfect for date night.